“I’ve got some extra lemons that I can’t use. ..
Who doesn’t like to hear that? I love it when friends with gardens and green thumbs offer up from their bounty. I don’t care what it is. Tomatoes, zucchini, peppers, oranges, I’ll take it! A few weeks ago after church services, a friend was giving away sacks of lemons from his own tree and I jumped at one. I gave a couple to my mother in law and a few more to my daughter in law and still had a whole bunch left for myself. After a few days I started thinking that maybe I had been too greedy in that I couldn’t possibly use all of these lemons before they went bad. Hmmm… a kitchen dilemma. The following day I got a wild hair and started cleaning out and organizing my small appliance cupboard and I mean really, really cleaning it out. I got down on my knees as this cupboard is low to the floor, peered back in the dark then being wary of spiders, I pulled everything out and took a hard look. I decided I really didn’t need two hand mixers and that mini chopper which had sat there gathering dust ever since I got my Ninja. Out they immediately went into the charity shop box! One thing that had been way, way in the back was something hubby and I received too many years ago as a wedding gift. It was an electric juicer. It sparked an idea in my head. I’d been using my old fashioned metal juicer for oranges and lemons for years totally oblivious to the fact that I had this marvel of modern technology sitting there lonely and forgotten. All at once I knew what to do with all those lemons. I would squeeze them all at once and freeze the juice in small portions for future use! Yay, the pressure would be off! Before I juiced them I even removed all the zest and froze it also. I felt inspired! 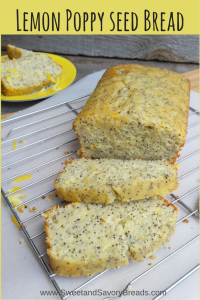 I’ve been gradually using these small portions of juice here and there in my cooking adventures but when I came across this recipe for Lemon Poppy Seed Bread I remembered that not only did I have juice ready but also the zest! Woo hoo, I was good to go! 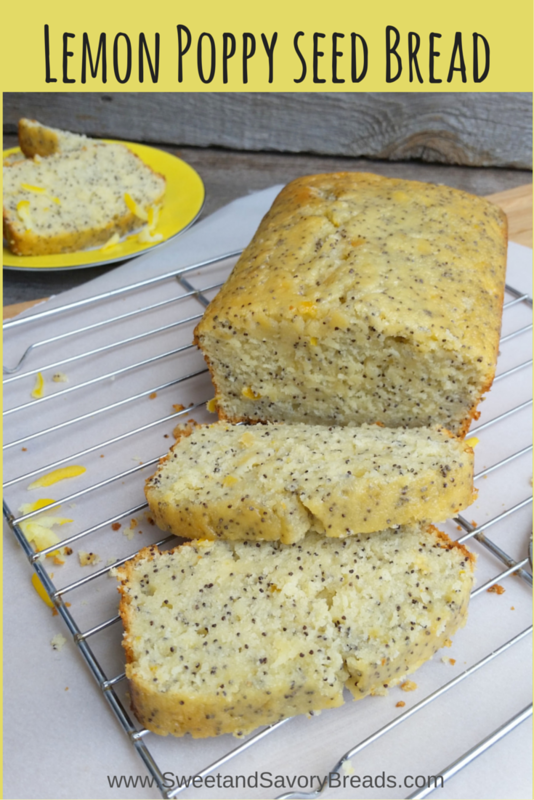 This Lemon Poppy Seed Bread is simple to make and has a lovely, bright lemony taste. It’s zesty flavor is magnified by a tart glaze which is generously brushed on and absorbed into the top crust while the bread is still hot. The poppy seeds give the bread a bit of crunch and of course visual appeal. 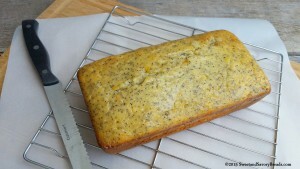 I adapted this recipe for Lemon Poppy Seed Bread from Cooking Classy by using what I had on hand. I substituted non-fat plain Greek yogurt and evaporated milk for the sour cream and regular milk called for in the original recipe and the final result turned out wonderfully! In fact, half of it may be gone before this blog post is even published! I hope you enjoy this Lemon Poppy Seed Bread recipe as much as I enjoyed sharing it with you. I encourage you to try it yourself and leave us a comment below. We would love to hear from you! 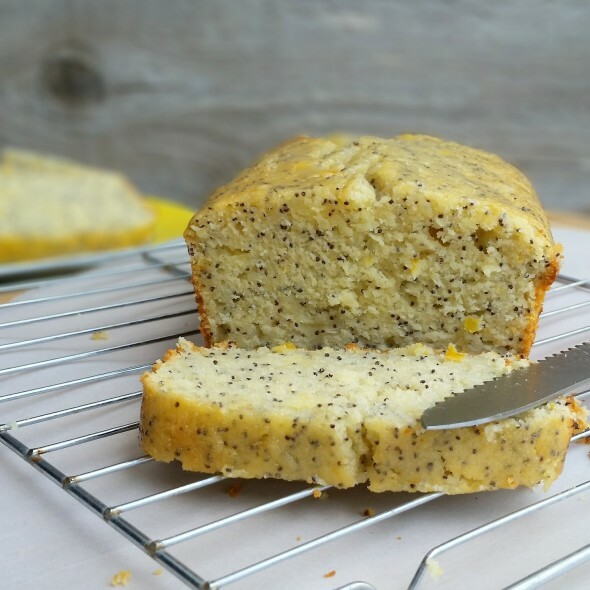 Lightly sweet and bursting with fresh citrus flavor, this lemon poppy seed bread is a marvelous addition to any brunch or tea table. Preheat oven to 350 degrees F. Grease and flour an 8" by 4" loaf pan. Set aside. In a large mixing bowl stir or whisk together the flour, poppy seeds, baking powder and salt until well mixed. Set aside. In the bowl of a stand mixer (or other large bowl if using a hand mixer) place the granulated white sugar and the lemon zest. Rub together using fingertips until the sugar takes on the lemon's moisture and color. Add the softened butter to the sugar and mix on medium speed until light and fluffy scraping down sides occasionally. Add eggs and vanilla extract mixing well. Place evaporated milk and yogurt in a microwave safe measuring cup. Whisk together then micro-cook 30 seconds just long enough to take the chill off. Add 1/3 of the flour mixture to the sugar mixture then 1/2 of the yogurt/milk mixture and 1 Tablespoon of lemon juice mixing until just combined after each addition. Repeat with another 1/3 of flour, the rest of the yogurt/milk and lemon, ending with the last 1/3 of the flour also mixing until just combined. Scrape the batter into the prepared pan and bake 45-55 minutes until a toothpick inserted near the middle comes out clean. Check loaf at the 40 minute mark and if it is becoming too brown on top you may tent with foil for the final minutes of bake time. Remove from the oven and allow to cool for 5 minutes in the pan before removing to a wire rack placed on top of a cookie sheet. Meanwhile prepare the glaze. Brush the hot glaze mixture on top of the bread allowing it to soak in before repeating until the entire amount is used. Allow to cool then serve or store in an airtight container. Combine the sugar and lemon juice in a microwave safe bowl and heat on high power for 15 second intervals stirring after each until the sugar is dissolved. Posted in Breakfast Breads, QuickbreadsTagged bread, eggs, greek yogurt, lemon, loaf pan, poppy seeds, sweet, yogurtBookmark the permalink.